In 1954, computer scientist and brilliant mathematician Alan Turing died after biting into an apple laced with cyanide—a real-life version of Snow White and the poison apple. It’s long been assumed that it was suicide, perhaps because he was frustrated and overwhelmed by the chemical castration the British government forced upon him after he admitted to having a sexual relationship with a man, which was against the law at the time. Recently, some have speculated that Turing’s death-by-apple wasn’t necessarily intentional. He was known to be careless with his experiments, and accidentally inhaling cyanide or accidentally placing an apple in a cyanide puddle wouldn't have been outside of the realm of possibilities. Still another theory is that British Security Services considered Turing a high security risk because he was gay, and may have sabotaged him rather than risk that Turing would spill government secrets or defect and work for the enemy. Whatever happened, the fact remains that a half-eaten apple was found by Turing’s bedside. Fast forward about two decades, to a few guys making personal computers in a garage. They had a name for their product and were now in need of a logo. 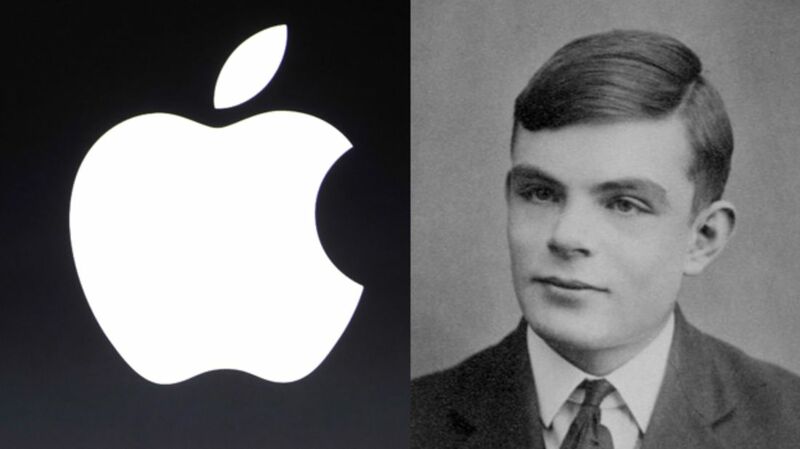 The men were aware of Turing’s contributions to computers and coding, and decided to honor him and comment on his persecution by removing a single bite from the apple graphic they had picked to represent their company. And that’s how we got the iconic Apple logo on the back of all of our phones, computers, and iPods. So the story goes, anyway. But as nice as it is, it simply isn't true, according to the designer who created the logo, Rob Janoff. “I’m afraid it didn’t have a thing to do with it,” he said in 2009. “It’s a wonderful urban legend.” Janoff says the single bite out of the Apple logo originally served a very practical purpose: scale. The size of the bite showed that the shape was an apple, not a cherry or any other vaguely round fruit. Other theories—that the logo references Eve biting into the forbidden fruit or Newton’s discovery of gravity—are also misguided. If you’re curious about the multicolored stripes on early versions of the logo, there’s a very practical reason for those, too: “The Apple II was the first home or personal computer that could reproduce images on the monitor in color. So it represents color bars on the screen,” Janoff has explained.